Some AFL games are underwhelming contests – at the start of the year, we were all hyped up for the Geelong v GWS game, but it turned out to be nearly a walkover. On the flipside, other games turn out to be more thrilling than you’d expect, and last night’s Collingwood-Bulldogs clash was one of them. It didn’t look like it’d be that great – the Magpies were obvious favourites, and the last few clashes between the sides haven’t been the most skilled – but the game surprised us with three quarters of entertaining football. Despite my grandfather and I arriving at the game slightly late, it didn’t matter – the opening stages of the game were made up of inside 50s that never went anywhere, simple marks fumbled, and kicking the ball to players who had no chance; almost like the game was being played in the Adelaide sludge we saw last week instead of under the Docklands roof. It took nine minutes, and a dodgy kick from Bailey Williams, for Collingwood to get the first goal of the game, Tom Phillips making the most of his turnover. The Bulldogs put their foot down in reply, kicking five straight goals to take the match firmly in their grasp. Matthew Suckling scored the Dogs’ first, a towering shot from outside 50, and was followed up by goals from Tory Dickson and Jordan Roughead. 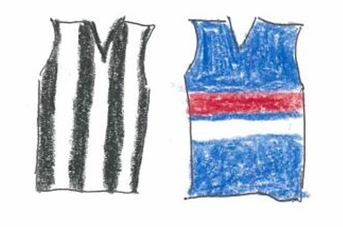 Dickson got his second from the goalsquare, Tom Langdon giving away a needless 50m penalty for a push in the back, and when Tom Boyd got one of his own (also from a 50), the Pies looked out of it and ready to lose their sixth straight against the Dogs. After the quarter-time break (where, with no sense of irony, the entertainment for the night spoke out against gambling advertisement before following it up with a beer promotion), Collingwood slowly eased their way into the game. Despite the two teams being roughly even, the Pies kicked four of the next five to be within a goal. The Dogs grabbed two back, Billy Gowers taking a strong contested mark and goal followed by Josh Schache’s first goal at Footscray – with a three goal lead at the long break, the Dogs were no doubt confident of an upcoming victory. What we didn’t know at the time was that Scahche’s goal was the last the Dogs would kick for the game. Steele Sidebottom kicked a goal in the scrum early on, and the Dogs’ chance at a reply was spoiled (in both senses) by Jeremy Howe, cutting off what would’ve been a certain goal. Marcus Bontempelli limped off soon after as Taylor Adams kicked another one for the Pies, causing worries amongst the crowd – despite disappearing down the race, he came back to play before the quarter ended. After Josh Thomas kicked his second goal, the Pies held the lead for the first time since the first quarter, which proved to be the death blow – after they lost the lead, the Bulldogs never looked in the contest. Instead, Dogs fans watched on as they saw their hopes of winning fade away further and further. They didn’t kick a goal in the entire second half – the first time they did this since 1991 – and as the clock ticked on and Collingwood kept scoring (Treloar, Pendlebury, Hoskin-Elliott), the crowd was waiting for the end to come. When the siren sounded, and Josh Daicos kicked another one just to rub it in, the Bulldogs had played out arguably their worst performance of the year. The worst of it all is that they scored more in the second half last week – against last year’s runners-up in horrible conditions – than this week, against a team that missed the finals while protected from the elements. Their earlier wins – over Carlton, Brisbane, and Gold Coast – have proved that the Bulldogs aren’t quite at wooden spoon levels, but they’re barely above it. What does the game tell us about Collingwood though? They should be applauded for being able to come back from their first quarter performance, but the problem is how they were ever able to be in that position. Top eight teams shouldn’t look down and out and quarter time, especially not when they’re playing opposition of this ‘quality’. Next week’s game against Fremantle should give us a much better look at where the Pies are at. Players like Treloar and Adams had no significant influence in the first quarter, but once they got going they helped Pendles get the midfield on top for a good recovery win. At the moment the Pies are king of the under 8’s (9th-16th), with a meritorious win over Adelaide. Will be interesting to see whether Bucks’ brand of footy stands up against the big boys who apply a lot more pressure.